Veera Tripathi (Alia Bhatt) feels suffocated at her own wedding preparations. She forces her fiancé for a drive to breathe the fresh air. That’s when she is accidentally abducted by a bunch of criminals. When Mahabeer Bhati (Randeep Hooda) comes to know that she is MP’s daughter, he chalks out a wise plan to make money. And Highway is all about Veera and Mahabeer’s journey together. The journey which is forcefully thrust up on Veera begins with fear, then slowly when she tastes freedom, friendship blossoms and a familial kind of bonding starts to evolve between Veera and Mahabeer. 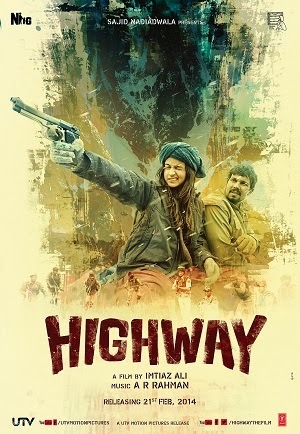 Highway also happens to be a journey of redemption and their attempt to give colors to their unpleasant childhood days. Imtiaz Ali, once again, takes us through the now-familiar lanes of Himachal Pradesh. He shamelessly flirts with the snow covered mountains and the roads; as audience we feel wooed and excited. Kudos to the cinematographer, Anil Mehta! AR Rahman’s music blends with the situations. Backgroud score is equallyu brilliant because it lets silence to override sounds as well. Irshad Kamil’s lyrics echoes the thought of Veera; sometimes Mahabeer’s too. Alia Bhatt as Veera emerges as a show-stealer. Her evolution is beautifully captured and she fits into the role perfectly. But I have to admit that if I saw a Poo of Kabhi Kushi Kabhi Ghum in Shehnaya of Student of the Year; I saw Geet of Jab We Met in Veera here. Am I seeing a Kareena in Alia, I wonder. Randeep Hooda as rustic Mahabeer gives away a lot through his stony looks and silence. There are few dialogs that will follow you from theater. They refuse to leave you. For instance, an awed Veers asks if one bullet is enough to kill a man. Mahabeer replies that it is more than enough to kill two; the one who dies and the one who kills. I appreciate Imtiaz Ali for travelling through less forayes roads… for making a movie that talks about a love that looks beyond the physical attraction… I happier that the climax was free from cliché. There are several instances where Veera reminds us of Geet; sometimes it would be the dialog she says or the way she behaves. The comparison and similarity between Geet and Veer becomes inevitable! When Veera gets into her fiancé’s car at night, her face is clear and eyes don’t bear any make-up. But, later, when we see her with mouth and hands tied, we see tears rolling down from kohl smeared eyes. How?! The flashback and the childhood days of Mahabeer seems to be ambiguous. He is a guy with good heart, then why is he is in the bad world? How did he come there? The question remains unanswered. And it’s also carries a strong message. I am not going to reveal it. It might be a spoiler. All I can tell you is that this movie is more than Stockholm syndrome. And travel along the Highway yourself! Nice Movie + Songs.... My Rating - 8/10.